Happy Halloween! We don’t know about you, but once the calendar hits October 1st, we are in full Halloween mode. (OK, real talk: We start planning next year’s costume on November 1st.) It’s time to break out the candy, start watching “The Shining” on repeat, and decorate our fingertips with the most amazing Halloween nail art. 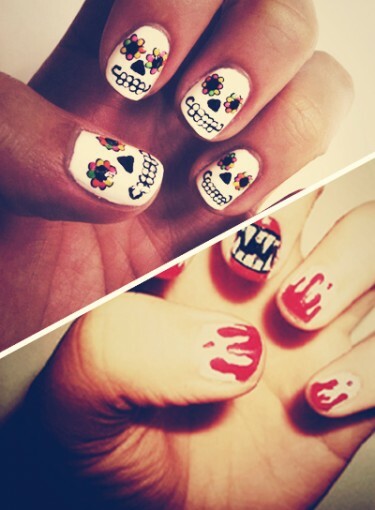 Click here to see all the best Halloween nail art. This year nail art designs are all about classic scary monsters, like Frankenstein (or Frankenstein’s monster for all you purists), skeletons, mummies, vampires, and ghosts. And whether you decide to go with a subtle hint of spooky or an intricate full-blown portrait of horror, there’s a nail design right here for you. Of course, it wouldn’t be Halloween without some gore, and we’ve got the blood spatter to gross out even the most ardent horror movie fan. But we’ve also got you covered if you’re going for cute with a design of one of Halloween’s favorite candies. The great thing about Halloween nail art is that you can wear it (and switch it up) for an entire month, unlike your costume, which is only good for one day. To make the most out of these designs, you better get started — Halloween will be here before you know it.